The Westbound bike lane “liability issue” the City of South Pasadena needs to be sued to fix. Imagine you are building a house. You take your plans to the plan check office in city hall and something bizarre happens: the officer at the desk is adamant that none of your doorways will be taller than 5 feet. What?! Why? The officer throws some vague legalistic language at you, but the reality is that the officer is 4’8″ and hates people taller than that. He wants a world built to his idea of normal and you and your 5’+ future occupants are not what he considers normal. You can’t back out now – loan documents have been signed, your name is on the lease and payments will come due soon. This has to get done now. The inspector insists that you install dangerous-by-design doorways. What do you do? You might try and appeal to a higher power in the city – ask to see the building code, planning law, or industry best practices that say you have to build something so dangerous. You might head to city council and address the matter in the political arena as an aggrieved constituent, or with neighbors, or members of a trade or industry group opposed to dangerous doorways. You might hire a lawyer and try your luck in the courts. All of these options mean wasted time and resources – things that are always in short supply in the construction business. If you’re the LADOT you skip those steps and say, “F(& it.”, and install the 5′ tall doorways, except we’re not talking about a house here, we’re talking about the York Boulevard bike lanes crossing a bridge over the Arroyo Seco and potentially connecting with existing bike lanes on Pasadena Avenue in the City of South Pasadena a few hundred feet away from LA city limits. The “officer” turns out to be three South Pasadena Board of Public Works commissioners, Steven Ray Garcia, Alexander Main, and Mathew M. Pendo, who decided that instead of doing the rational thing, the safe thing, and taking Pasadena Avenue down to one lane in each direction as it crosses over the York Bridge, that they don’t like people doing anything but driving at excessive speeds. These three commissioners insist that an “expensive” bike lane network connection in their city (.1 miles of bike lane, 528 feet, that will cost approximately $4,000 dollars to stripe) is not worth doing. These commissioners decided that bike riders being dumped into 35mph+ car traffic lanes for 528 feet, heading into a curve, is an acceptable outcome and will keep all road users safe. Commissioner John Fisher commented that if we leave the lanes as is, with the four lanes, there is no room to add the striping. He noted the City of South Pasadena has adopted a bike plan and this is a part of the network that has been adopted. We have bike lanes coming from the west and we have bike lanes coming from the east. So, all we are talking about is connecting the two over the bridge. He stated we have normal lane widths and buffering between the opposing flows of traffic and between motor vehicles and bicycles, which appeals to him from a safety standpoint. He stated regarding the ideas of striping, if we are to add additional lanes we would have to take a lane away because of the narrow widths of the bridge. Under California Law, this is the appropriate way of stripping as you approach an intersection a bike lane is always dashed. Motorists and bicyclists are to share the lane. The advantage to this is if we have bicycle traffic as expected, that motorist can use that space to turn right onto San Pasqual. He stated he thinks this is a better operation and consistent with the bike network that the City has adopted. Commissioner Mathew M. Pendo disagrees and he mentioned one of the things we need to take into consideration is the possibility of accidents. There are a lot of things we need to look at before moving forward. Commission Alexander Main stated he is a cyclist, road cyclist and a commuter cyclist and he has gone over this bridge. He is a supporter of bike lanes, but not over the bridge because it’s too narrow. He stated with bridges there is a lot of debris along the curbs and it causes bicyclists to go inward. It’s a lot of traffic. He is not in agreement to reducing it to two lanes. Commissioner John Fisher stated the proposed re-striping provides buffering between the curb and motor vehicles and between east bound traffic and west bound traffic. If it’s the sense of the commission not to install bicycle lanes over the bridge, then we need to take a look at the existing network we have created and may need to remove the bike lanes leading up to the bridge. If we are telling bicyclists by striping bike lanes that this is the network that they can use and then you drop them they may be exposed and at risk. Commissioner Clinton Granath suggested looking at other alternative routes either North or South of the bridge. He question if the City of Los Angeles could unilaterally build this over to our city limits? Deputy Public Works Director Furukawa stated he asked that of LADOT and they would stop the striping west of the bridge and drop the lane on their side of the bridge. Discussion continued about other alternatives. Chair Garcia gave his concerns about creating this fairly pricey bike lane system not only in South Pasadena, but also in the City of Los Angeles and then having the bike lanes disappear at the bridge. He stated from a liability stand point, we may have some obligation to provide something, but he is not convinced this is the best something to provide. Based on the evidence and the issues presented he has a difficult time favoring this. Chair Steven Ray Garcia asked if there were any more comments and there were none. He called for a motion. He then suggested using the same motion from the previous meeting with Commission Fisher making the motion and seconded by Commissioner Granath. By roll call 2 –ayes (Fisher, Granath) and 3 – noes (Garcia, Main, Pendo) motion failed. Meeting Minutes from November 13, 2013 South Pasadena Public Works Commission hearing. Bold text added. On July 9, 2007 the City of Los Angeles counted the number of cars at the intersection of York Boulevard and San Pascual Avenue – on the Los Angeles side of the York Bridge. On that day, 8,602 cars drove from South Pasadena to Los Angeles and 10,806 drove from Los Angeles to South Pasadena over a bridge that was 4 car lanes wide – a massive oversupply of road width given the number of cars driving. Given this low car volume, when tasked with striping bike lanes across the York Bridge the LADOT wanted to remove a travel lane in each direction. Doing this would have no impact on the low peak hour car trips across the bridge, but it would deal with one particularly nasty section of Pasadena Avenue approaching the York Bridge. Pasadena Avenue has a westbound bike lane that stops 528 feet short of the York Bridge in order to maintain two full car travel lanes over the bridge. There is a cement curb on one side and a cement median in the middle of the road – altering either cement fixture means tens of thousands of dollars in demolition and repaving work. A 528 foot gap in lane striping, and a huge gap in rational decision making, keeps LA disconnected from South Pasadena. To fit a bike lane in this 528 foot stretch of Pasadena Avenue without messing with these expensive options, the City of South Pasadena would need a few thousand dollars (based on LA’s bike lane costs, I estimate this .1 mile stretch repainting to cost ~$4,000) to cover old lane markings and lay down some new thermoplastic paint for large merge arrows for cars and a bike lane for bikes. It was decided in November of 2013 by South Pasadena Public Works Commissioners Steven Ray Garcia, Alexander Main, and Mathew Pendo that the City of South Pasadena wanted to send bike riders straight into the path of motorists for a 528 foot stretch, on a westbound curve, between the end of the bike lanes on Pasadena Avenue and the beginning of the bike lanes on the York Bridge. What we are left with is a dangerous and unacceptable situation created by three men who damn well knew what they were doing when they voted down John Fisher’s motion on November 13, 2013. The road bed was torn up and repaved. Thousands have been spent to stripe the road in a dangerous new configuration. 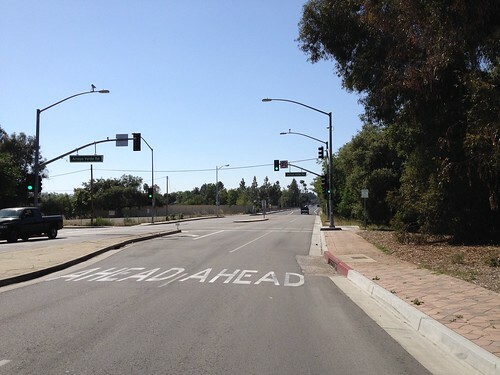 The York Bridge road diet needs to be completed at a cost of several thousands more: one car lane in each direction and a bike lane connecting Pasadena Avenue to York Boulevard. The only people I can think to blame at this point are South Pasadena Public Works Commissioners Steven Ray Garcia, Alexander Main, and Mathew Pendo.